Hawaii is without doubt one of the most beautiful areas of the world as it boasts endless stretches of sandy beaches fringed with palm trees and cool, clear water. There are also dense jungles here to trek through as well as dramatic natural features such as dormant volcanoes and deep canyons. The beaches on the Hawaiian Islands have earned a reputation among sun worshippers as excellent places to sprawl out and soak up the sun. There are dozens of popular beaches to choose from here as well as more secluded sandy coves for people who crave a little peace and quiet to enjoy. Among the beast beaches on the Hawaiian Islands are Sunset Beach, Hookipa Beach and Secret Beach. The Big Island is a great place for nature lovers to explore either independently or as part of a guided tour. 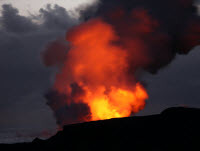 The large and lovely Hawaii Volcanoes National is just waiting to be explored and trails lead through the rainforests and up to the summits of two active volcanoes. The island is extremely ecologically diverse and is also home to areas of deserts and swamps. Visitors who have their own transportation will be able to drive away from the touristy centres of Hawaii to explore the natural beauty spots at their leisure. Located on the Big Island is the enchanting oasis of Kiholo Bay. This area is fringed with palm trees and surrounded by large lava fields, while the main beach here is covered with striking black volcanic sand. Secret Beach is situated on the north coast of Kuaui and is a great place to escape from the hustle and bustle of modern life for a while. Both local people and tourists alike retreat here to sunbath in the secluded sandy area while enjoying the scenery. People who have a strong sense of adventure are sure to enjoy the journey to Secret Beach as it is reached by hiking along a winding trail through the jungle. The stunning natural phenomenon known as the Toilet Bowl is located just a short stroll from Hanauma Bay on Oahu. Visitors who venture this far will be able to admire the impressive hole formed in the rocks that leads down to a hidden underground cave.